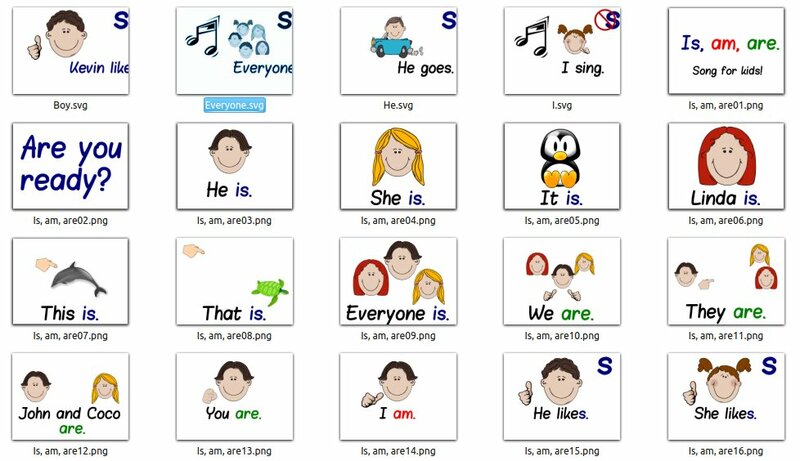 I teach English to seven year olds in China. 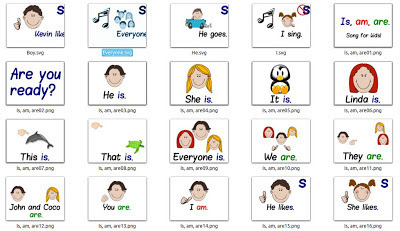 One point of English grammar that is especially difficult for a native Chinese speaker is when to use "is," "am," and "are," or when to add an "s" to verbs (example: "I like," or "he likes"). To make this easier for my students, I decided to write, sing, and put together a music video for them to watch. 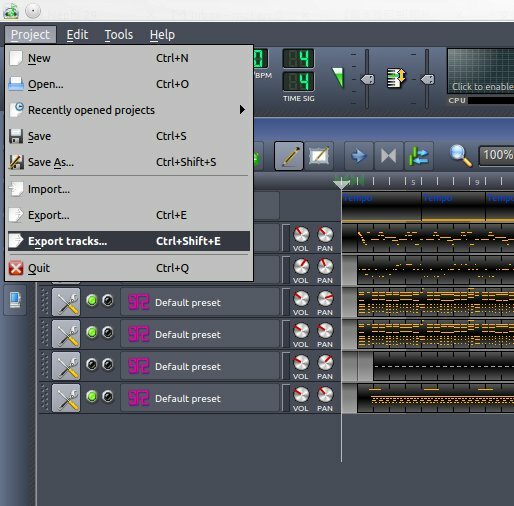 I will not be doing a tutorial specific to each piece of software I used, but with rather write up a guide of sorts saying how and why I used each piece of software. I have been a long time advocate of Linux and especially open source software. I hope that my music video demonstrates that a professional(ish?) 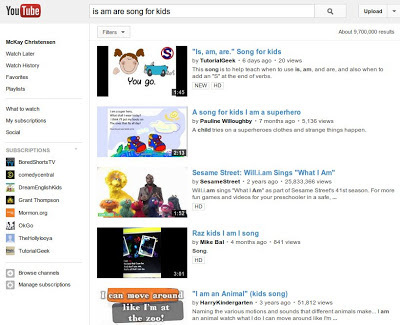 music video can be created using only open sourced software. 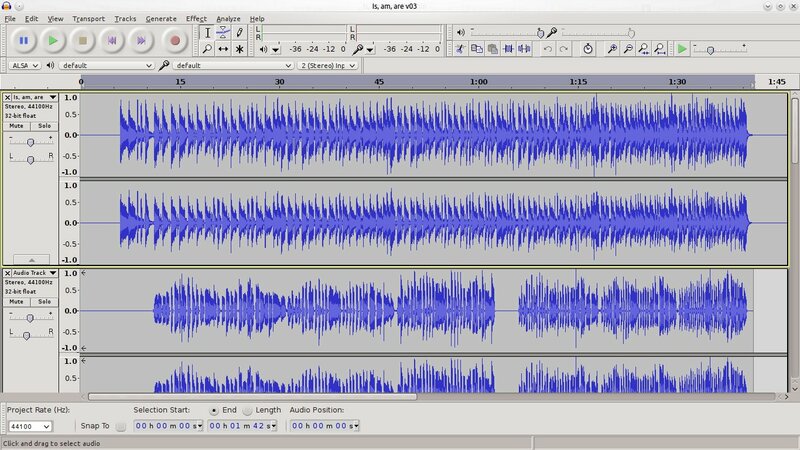 I used LMMS because for me it is the program that works best in Linux for playing sound for musical notations (there are many programs that play musical notation, but many of them are quite difficult to actually get sound to come out of). 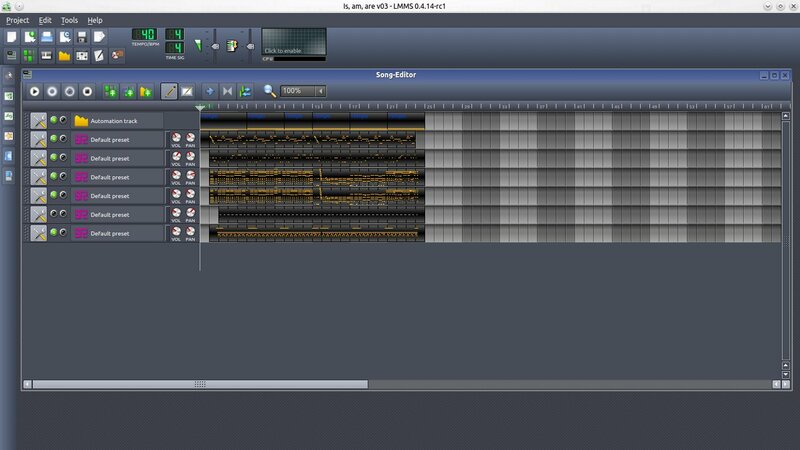 I downloaded a MIDI version of 10 Little Indians and modified it a bit for the base of my song. 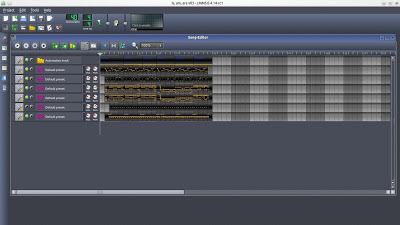 LMMS is good for this because it allows you to easily change instruments to change the sound of your song. You can do a lot of fine tuning in LMMS as well, but I chose to stick with something basic and simple. 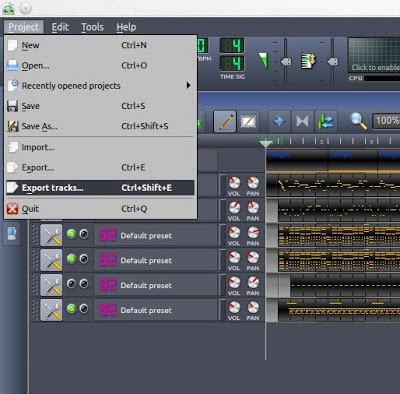 Once I had the music to my liking, I did a simple export (you can export as WAV or OGG). 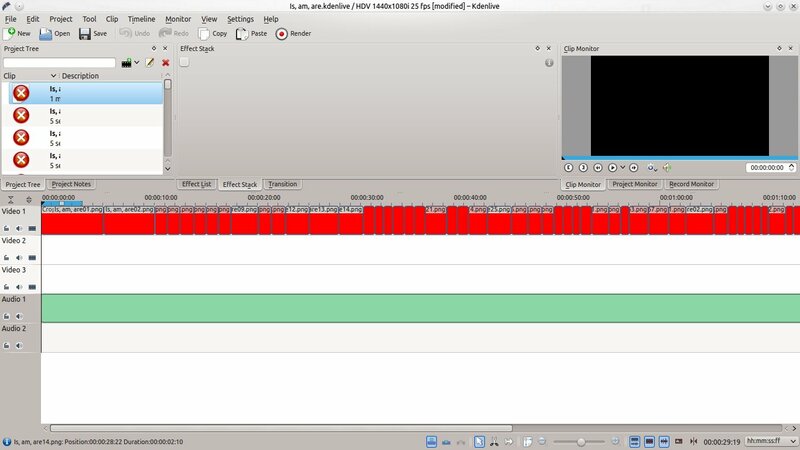 I imported my music track into Audacity and recorded my audio track. I don't like the sound of my own voice much, so I decided to do a chipmunk track to cover my voice up a bit. Audacity allows you to change the pitch of your voice without changing tempo. I found that this makes the audio sound a bit chopping though and not like the clear crisp Chipmunk sound you can imagine from the 60s. To get a gunuine Chipmunk sound, you will need to slow down the audio track, then record your voice, then speed everything back up again. This turned out to be a bit tricky (you cannot simply decrease by 40%, record, then increase by 40% and expect it to be where you started. I had to do a bit a guess work for this). Once I finished with the vocals, I exported the whole thing. For the video, I wanted some nice clipart, to do a slideshow of sorts. You can do a simple Google, image search and get whatever you see, but the legality of that can often be questionable. I prefer to use royalty free images. 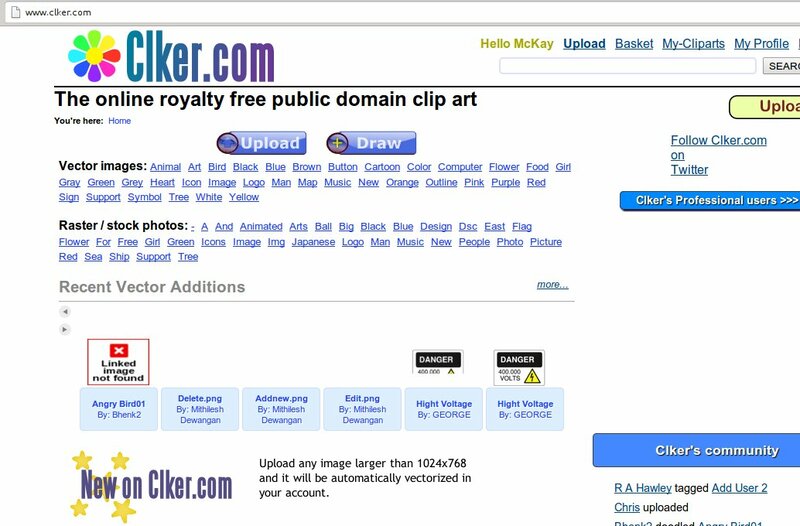 clker.com is the site I use for that. Clker is great because it allows you to download vector (.svg) files. 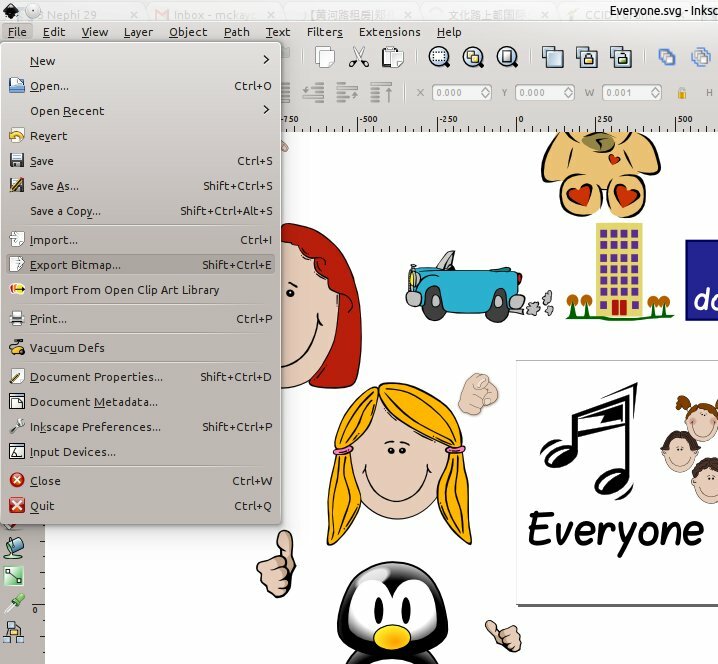 Once you have downloaded all the clipart you want, you can put together your images using Inkscape. 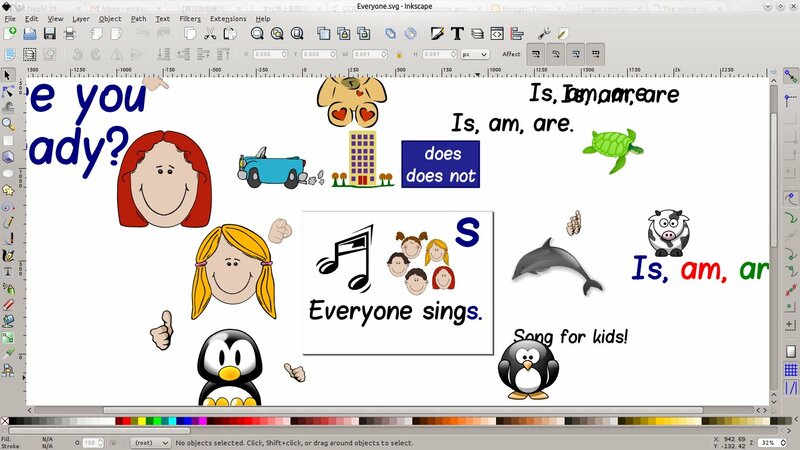 I used Inkscape to move clipart around and add text for each different frame of my music video. This ended up being the most time consuming and tedious part of the entire process. I had to export each different from as a .png file. Once I had each image exported, I used Kdenlive to put everything together. Kdenlive is a great video editor that allows you to simply drag and drop images, audio, and video clips to create your new video. Once everything is put together, simply export the video and use the video as you please. I uploaded the video to Youtube.com. You can find it here if you would care to see.